Dinner Menu for January 3rd – If You Have Time! 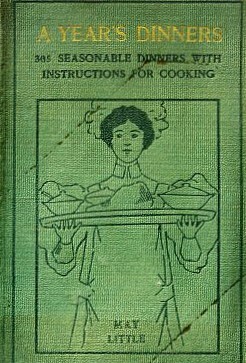 May Little wrote “A Year’s Dinners”, in 1910, which features menus (breakfast, lunch and dinner), for every day of the year. If you haven’t already started the preparations by now, it’s too late! And don’t forget that you still have to clean out the ashes from your 500-pound cast iron, wood-fired stove, from yesterday’s dinner! 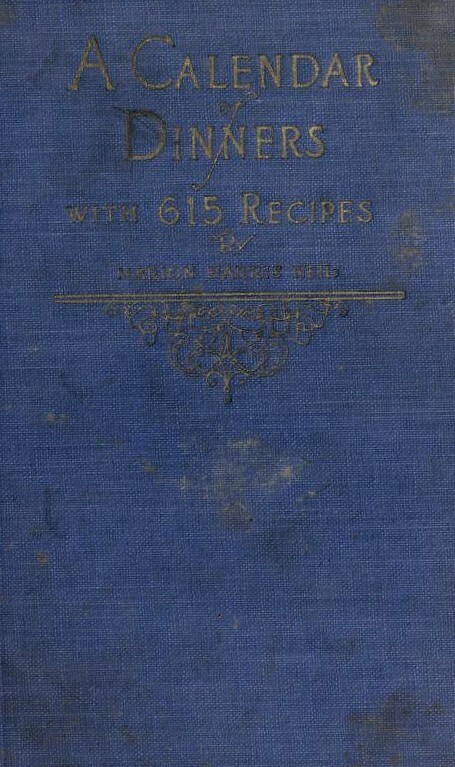 Fast-forward a few years to 1915, when the first edition of “A Calendar of Dinners with 615 Recipes”, by Marion Harris Neil, was published by Crisco. Other editions continued through 1922. Included are dinner recipes for every day of the year, with recipes. As today is January 3rd, if you were in the kitchen around 1915 to 1922, this could be the dinner you would serve your family, if you had the time! You would have already made a trip to your grocer or fishmonger to purchase two live lobsters and dressed your pigeons for roasting. The rest of the day is spent peeling, dicing, shredding, slicing, mixing, beating, cooking and just having fun in the kitchen! So, really, folks, what are you serving your family for dinner tonight, January 3rd, 2014? Better get cracking! This entry was posted in Cookbooks, Cooking, Cooking and Social History, Cooking Technology, Eating, Food Trends, Menu Planning, Recipes, Uncategorized, Vintage Cookbooks and tagged 1910 Menus, 1915 Menus, cookbooks, Cooking, Crisco, Marion Harris Neil, May Little, social history, time capsules. Bookmark the permalink.